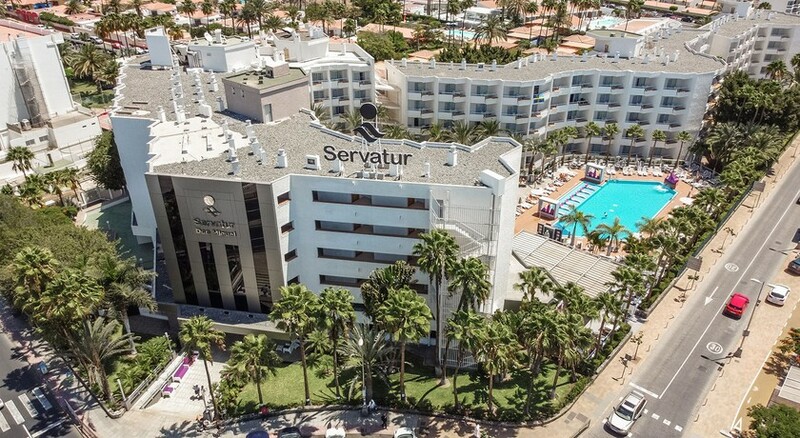 The Hotel Riu Don Miguel is centrally nestled in Playa del Ingles amid beautiful gardens on the island paradise of Gran Canaria. If you want to relax or have fun, you can do both by taking advantage of the outdoor swimming pool (heated in winter), free sun loungers, sun terrace, gym and much more. This comfortable complex is 3km from the popular beach of Playa del Ingles. There are ample food and beverage facilities in the hotel with a main restaurant that serves breakfast and dinner in buffet style on the other hand the pool side snack bar serves light meals for lunch with an additional charge. The hotel offers luxurious double guestrooms with modern amenities and a convenient location close to a wide variety of shops (Kasbah, Metro Plaza Maspalomas), bars and restaurants. 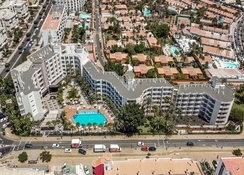 The Hotel Riu Don Miguel is conveniently situated in San Bartolomé de Tirajana, Las Palmas, Spain. It is just 3km away from the traveler-favorite Playa del Ingles beach. The local bus stop is 200m from the property and connects you to all points on the island. Gran Canaria Airport is 30km from the hotel. Playa del Ingles is chock-full of bars, pubs and clubs, especially in the Kasbah centre, which is a home to the famed Cream and Pascha nightclubs, both of which pump out the best in dance music until the early morning. The Riu Don Miguel features luxurious rooms that come in the following categories: Family Room (2 Bedrooms) with living room, Double Standard and Individual Room. These rooms have all the facilities to make it feel like a home-away-from home. They come with the following amenities air conditioning, Wi-Fi (additional charge), in-room safe (additional charge), mini bar (additional charge) and balcony/terrace. Rooms for solo travelers are also available. Gran Canaria is a vast ocean of aromas and flavors, which have influences from different corners of the world that include wide-ranging fruits, fresh sea food and vegetables. The hotel houses an exquisite buffet restaurant and a la carte restaurant, where you can explore local and international delicacies. All the dishes are prepared leveraging healthy ingredients. Other than this, there is a snack bar, where you can grab refreshing drink and snacks. At Hotel Riu Don Miguel, sun and fun can accompany you throughout the day with sports facilities such as sailing, windsurfing, jet skiing, whirlpool bath and much more. Guests can stay in shape by utilizing the state-of-the-art gym with expert trainers. The hotel offers free bus service to the beach, making it convenient for the beach lovers. Take a relaxing swimming at the hotel’s outdoor swimming pool, where you will also find sun loungers sparkled across the pool. Golf lovers can also tee off in the heat, as there are several golf courses within the vicinity of the hotel.